Bio: Toni Lindahl has lived in North Carolina for thirty five years and holds a Masters Degree from New York University. Her paintings have won numerous awards in national juried exhibitions. She is a member of Greenhill Center for North Carolina Art, The North Carolina Pastel Society, Associated Artists of Winston-Salem, The Degas Pastel Society and was awarded the title of Master Pastelist from the Pastel Society of America. She is included in Who's Who in American Art and her work has been published in The Best of Pastels, Portrait Inspirations, and Floral Inspirations by Rockport Publishers. Her work was featured in the French art journal Pratique Des Arts. Her paintings are in numerous private and corporate collections including Glaxo, R.J.R. Tobacco, Steelcase, Sheraton and Hilton Hotels, Lowe's Companies, and Duke University. Lindahl is represented by the Greenhill Center for NC Art, and by the Tyler White Gallery, both in Greensboro, North Carolina. Subjects: Her pastels are diverse in subject matter, ranging from florals and figurative work to landscapes. She has used her work to explore her interest in environmental issues through her Leaf Patterns Series. Gallery: Animals; Cityscapes; Figuratives; Florals; Landscapes; Leaf Pattern Series; Orchard Vineyard Garden Series; Still Lifes. Image View: Thumbnails enlarge in a viewer where they may be scrolled ; they are labelled with title and dimension. They can be downloaded. 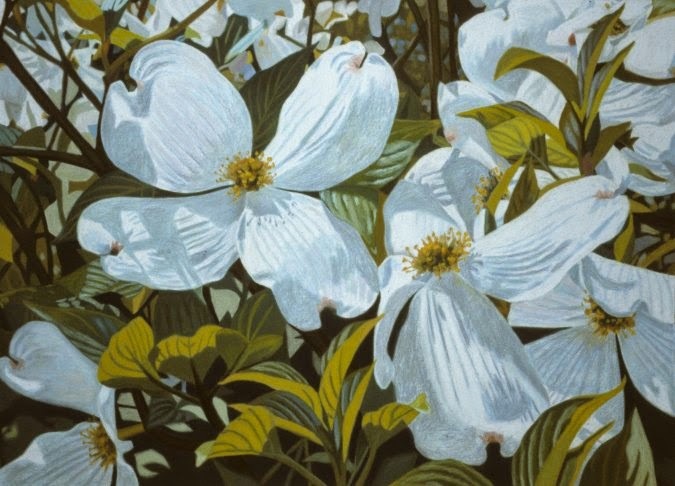 Dogwood is 18 x 28 ins, 675 x 486, 73.2 KB. Bio: Charles Peer received his MFA in Painting and Drawing from the University of Arkansas in 1979. In 1990 he moved to Siloam Springs, Arkansas to take up a teaching position in the Department of Visual Arts at John Brown University. In addition to serving as professor he is also Director of the university’s Fine Arts Gallery. Peer is a signature member of the Pastel Society of America and the Ozark Pastel Society. He has served as a guest artist for many arts organizations, the juror for regional competitions and the leader of pastel workshops. 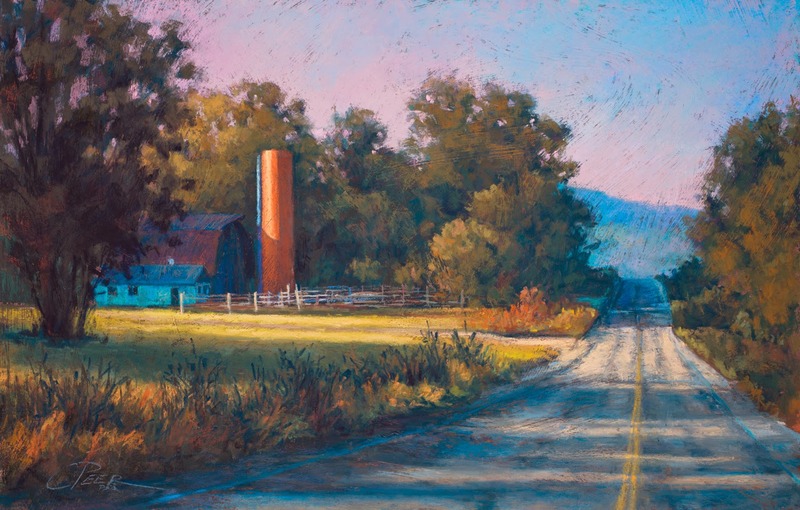 His artwork has garnered many awards, including the President’s Award at the Northwest Pastel Society’s 28th Annual International Open Exhibit 2014, an Honorable Mention in the Richeson 74 Landscapes, Seascapes & Architecture Exhibition in 2014 and Best of Show at the Ozark Pastel Society in 2012 and 2013. Peer’s work was included in Best of American Pastel Artists. In 2010 he was selected as the summer Artist-in-Residence for the Buffalo National River. He is represented by Gallery Central, Hot Springs, Arkansas. Navigation: No problems with this clear, rewarding website. Image View: Thumbnails enlarge in a scrollable viewer where they are labelled with title and dimension; their are a generous size and make a fine show ; also they may be downloaded. Headed South is 18 x 28 ins, 1500 x 956, 1.32 MB. Bio: Tiziana Ceschin lives in Rome, Italy and now works and teaches at her studio and in the silence of the Lazio countryside. Fascinated since childhood Tiziana by colours and the design, she studied graphic arts, and tried all the techniques of painting, before specializing in oil paint, acrylic, and pastel. Her love for animals, especially cats, led her to master the techniques to be able to paint with precision in these three mediums, making her portraits extremely realistic and expressive. To further refine her technique in pastel, Tiziana studied with master wildlife artist Eric Wilson, bringing even more realism and detail in the construction of the hair and in the study of the effects of light and shadow. Tiziana is the author of a book of six projects for those with no formal artistic background, who have the desire to learn to paint. The projects are accompanied by photos, drawings, and all the steps required to complete the projects. 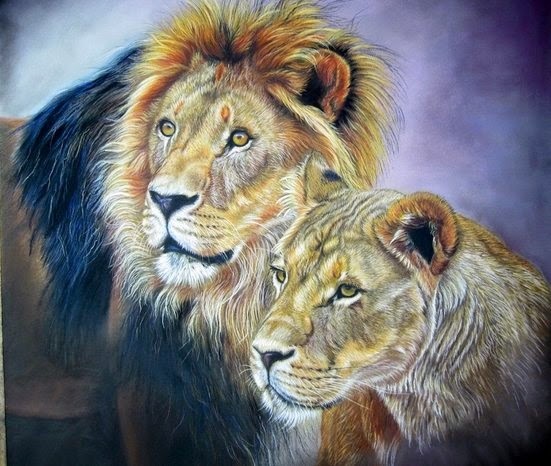 Her work has been exhibited in numerous exhibitions; including two installations dedicated to wildlife, where artist has presented her paintings of wild African cats. Subjects: Animals; Portraits. I came upon Tiziana on Facebook and was greatly impressed by her portraits. But she has mostly wildlife and cats on her website. Navigation: This website is in Italian. It is neat, well-organized, and navigable. Gallery: Maestosita (Majesty); I cuccioli e il gioco (Puppies and play); Sogno di liberta (Dreams of freedom); Predatore (Predators); Specchio del'anima (Mirror of the soul). Image View: Thumbnails enlarge in a viewer on the same page, where they may be scrolled; they may not be downloaded. Medium is often omitted; and dimension is not regularly noted. Bio: Andrée Launay lives in Le Grand-Quevilly, Normandy, and is a primarily self-taught artist. She studied drawing and painting in Rouen and Paris respectively, and three years of life drawing from 2007-1010. although she has studied with several pastellists (including professional artists of the Société des Pastellistes de France) She has exhibited widely in juried French Salons, including those at Livry-Gargan, Yvelines, and Giverny, and has been the recipient of several awards for her work. Style: Representational, somewhat naive, but attractive. In her own words : La peinture a toujours été pour moi une passion. Simplement elle a été mise longtemps entre parenthèses, étant prise par la vie familiale et professionnelle.Après m’être essayée à différentes techniques, le pastel m’a paru correspondre le mieux à ma sensibilité par sa richesse, sa douceur, les subtilités qu’il offre et la variété de ses nuances. Je me suis investie plus complètement depuis 2007 en approfondissant mes connaissances avec des cours ainsi que dans divers ateliers. J’ai également enrichi ma technique auprès de pastellistes chevronnés qui m’ont ouvert des perspectives nouvelles, et je poursuis toujours un travail en atelier. Navigation: The website is in French, powered by Book.fr, neat and modern in conception unlike so many French sites. Image View: Thumbnails enlarge in a viewer (click on Grand Format) and scroll vertically. Alternatively, click on Diaporama for a Slideshow. Download is not possible. Jeux de lumiére is 65 x 50 cms.